It’s a gingerbread time of year. I’ve been thinking about my grandmother’s gingerbread, feeling like a little spicy dark cake would help round out the grays of winter. 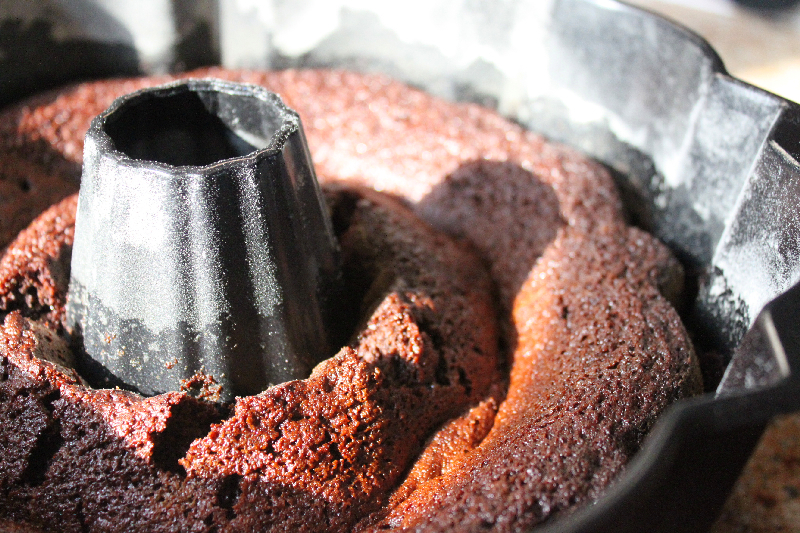 Grammy made her gingerbread in a bundt or tube pan, creating a round cake with a big hole in the middle. When you serve this for any sort of occasion, that big hole is a perfect “bowl” for a pile of lightly sweetened whipped cream. That’s not what made this gingerbread stick, though. What I remember best about this O-shaped gingerbread was the lament. Almost every time Grammy made it, her gingerbread fell. A sunken crease deflated the ring. Grammy wondered what on earth had gone wrong. According to her, this dessert was a failure every time. She’d apologize, she’d agonize, she’d throw her hands up. She completely missed the fact that everyone loved her gingerbread. I envisioned fixing Grammy’s perennially collapsed gingerbread, solving its issues. But really, why? It tastes delicious. It’s an excellent foil for whipped cream and for homemade applesauce. It always stays moist, a challenge for many gingerbreads. So rather than say the cake needs fixing, let’s just call it like we see it: Fallen gingerbread. Go ahead and smile when you see that crease. Tell people this is exactly the way the gingerbread should be. In a large bowl, cream the butter and sugar. Add the egg. In a medium bowl, mix all dry ingredients together; in a small bowl or measuring cup, mix water and molasses. Add the dry and the wet alternately to the butter and sugar mixture, about half of each at a time, mixing well between additions. Pour batter into the pan, and transfer to the oven. Bake the cake for 35-40 minutes, or until a cake tester, skewer or broom straw inserted in the middle comes out clean. Let cool for 15 minutes in pan, then loosen around the edges and turn out onto a serving platter. Serve either warm or at room temperature.